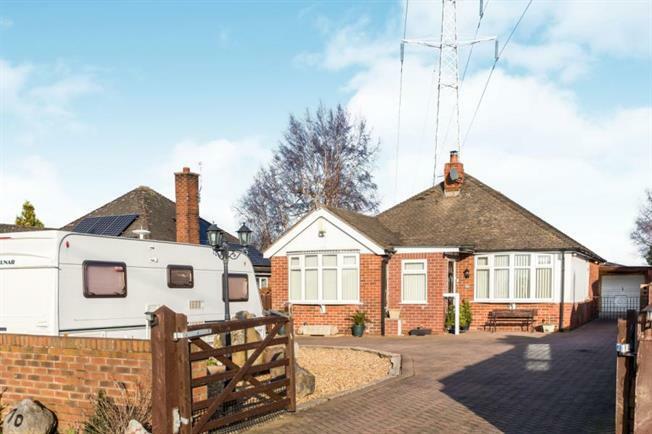 3 Bedroom Detached Bungalow For Sale in Nantwich for £350,000. Looking for a gorgeous, homely bungalow with lots of space, tastefully modernised throughout? Something very close to Nantwich, with countryside views? Look no further, this is it! This lovely home is immaculate and well presented throughout. Comprising of a generous hallway, stunning kitchen, open plan dining room, lounge and garden room with multi stove burner. There are two downstairs double bedrooms, one at the rear with double doors to the patio. Also downstairs a beautiful bathroom with roll top bath. Upstairs another double bedroom with views of the countryside and lovely shower room. Externally a large block paved driveway and car access at the side to the double garage and workshop. The landscaped rear garden also has sun awning and brand new summer house. Viewing is essential to appreciate this absolute gem! Approximately 2.5 miles outside Nantwich, a charming market town set beside the River Weaver with a rich history, a wide range of speciality shops, boutiques & four supermarkets. In Cheshire, Nantwich is second only to Chester in its wealth of historic buildings. The High Street has many of the town's finest buildings, including the Queen's Aide House and The Crown Hotel built in 1585. With easy access via the A500 to major motorway links. Composite front door, carpet, two radiators, window to front, coving. Open plan lounge/dining/garden room. Lounge area has feature fireplace with electric fire, carpet, radiator and coving. Open plan lounge/dining/garden room. Dining area has multi fuel stove, open stairs, under stairs cupboard, radiator, bay window and side window, carpet and coving. Open plan lounge/dining/garden room. Garden room has double doors to patio with awning, plus three dual aspects, raidator, carpet and laminate flooring and coving. Fitted wall and base units, wood effect roll top surfaces, integrated fridge, freezer and washer, Beko double oven/grill/warming plate and seven has rings, tiled splash back, stainless steel extractor fan, stainless steel sink, side window, composite back door, laminate flooring. Double doors to the patio with awning, radiator, carpet. Ornate WC and large pedestal sink, roll top bath, antique style radiator with heated towel rail, tiled walls and floor, extractor fan, two patterned windows. Two fitted cupbards, radiator, carpet, wonderful views of the countryside. WC, vanity sink unit with inset sink and mixer tap, single shower, part tiled walls, tiled floor, sky light, extract fan. To the front, a large block paved driveway and low maintenance gravelled garden, some grass beyond wall to road. Side access for cars to garage. To the rear, lawn, two patios, double garage, work shop, brand new summer house, shrubs and lovely countrywide views beyond.